And finally the long wait was over and the judges tasted the mystery wine that David Lawrason had chosen. It was red – well actually deeply purple and opaque, leaving long legs running down the side of a wine glass when we swirled. It had a big fruity nose full of ripe cherries and currants with just a hint of oak – the sort of nose that made you think it might be a fruit bomb on the palate, but it was more subtle than that… Smooth, rich, dense, yes fruity, but shot through with a forceful acidity that led us to think it might be an easy wine to match, and with soft, well integrated tannins and high alcohol at 14.9%. It was the Mission Hill 2016 Vista’s Edge Cabernet Franc, made by winemaker Darryl Brooker just across the lake – gorgeous stuff and, at around $25 a bottle, a very generous donation from Mission Hill. What would the chefs do with it? Andrew Morrison and I went down to Okanagan College on Friday afternoon to see the chefs at work. They use the College’s kitchens to prep their dish for this competition. The mood was remarkably calm, the chefs and their teams as cool as cucumbers. They returned hundreds of unspent dollars which will be donated to the Kitchen Party’s three causes. That night the judges tasted blind, hidden away in a private room, the dishes brought in to us one at a time at 10-minute intervals. The order of service had been randomly chosen. 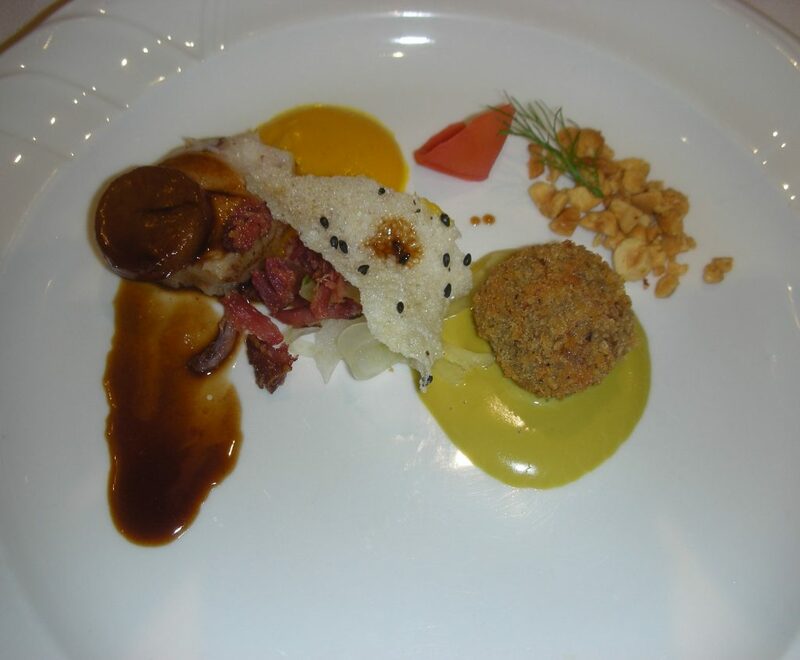 First up was Chef Christopher Hill (Saskatoon) who had plated his dish very prettily. 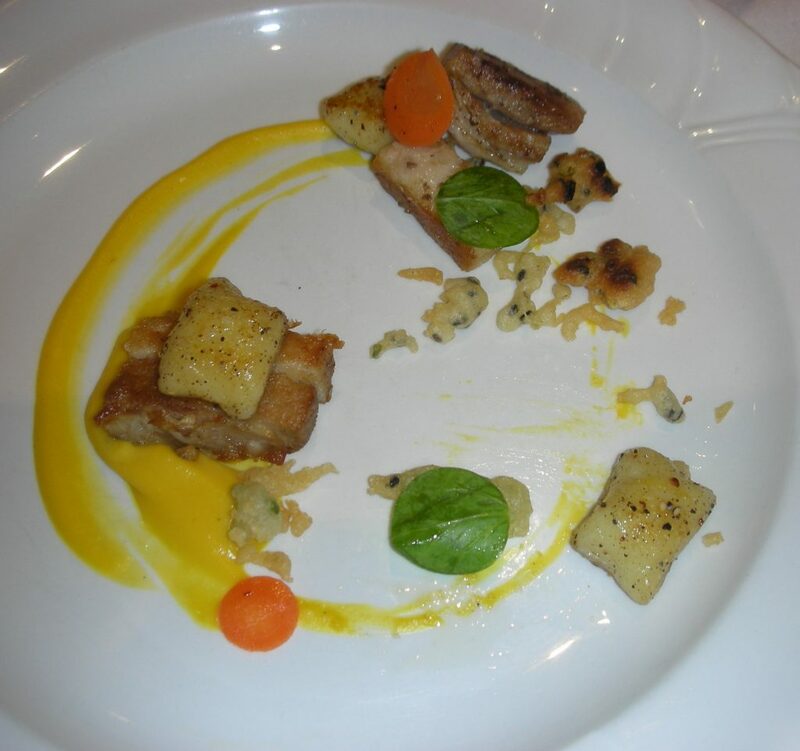 He had spent much of his allowance on pork belly which he confited in its own fat with fennel seed, garlic and bay, then pressed and cut into small squares which he seared to a crisp and sprinkled with Maldon salt. Beneath the two pieces of meat was a little savoury purée, lightly textured and made from the flesh of smoked tomatoes and red peppers, both flavours intensely present and true. Between the pork was a tender agnolotti of pasta dyed black with squid ink and filled with a soft brandade made of mashed and lightly salted ling cod, potato, ricotta and cream. A green brunoise of fennel, celery and squash in a lemon-herb vinaigrette proved to be a fine condiment for the pork, as did a very small dot of intensely flavourful green olive purée that reached out and spoke to the wine in its own language. 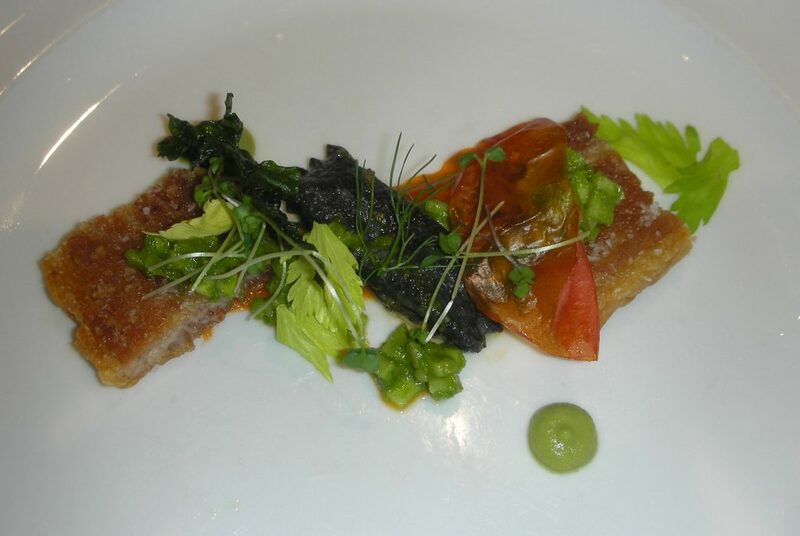 A number of garnishes, all perfectly executed, orchestrated the dish – the dried skin of the smoked tomato, some fresh celery leaf, fennel fronds and microgreens and a fried baby kale leaf that melted on the tongue. It was a beautifully achieved dish and while there was no epiphany with the wine, they both got along just fine. Up next, Chef Elia Herrera from Colibri (Toronto). She decided to play to her strengths with a dish of gentle Mexican flavours and a fair amount of subtle sweetness – an approach to the acid in the wine that was taken by several chefs. The heart of her dish was pork shoulder, diced into pea-sized pieces and flavoured with a moist, complex marinade derived from almonds, pine nuts, dried apricots, plantain, raisins, prunes, varuious herbs and spices, brown sugar and sherry vinegar. Browned in the pan, the meat emerged tender and heady with all those sweet-salt aromas. Chef also made a rich, creamy sauce of walnuts, cinnamon, evaporated milk, cream and a little brown sugar – less sweet than it sounds and decidedly sophisticated. For freshness, she added pomegranate arils, like a scattering of rubies, and thin slices of juicy, compressed green apple. The plate was finished with some drops of poblano-parsley oil, some microgreens and a crown of crisply fried parsnip ribbons. It was a delicious creation but while the sweeter flavours on the plate challenged the wine, they only succeeded in pushing it around. 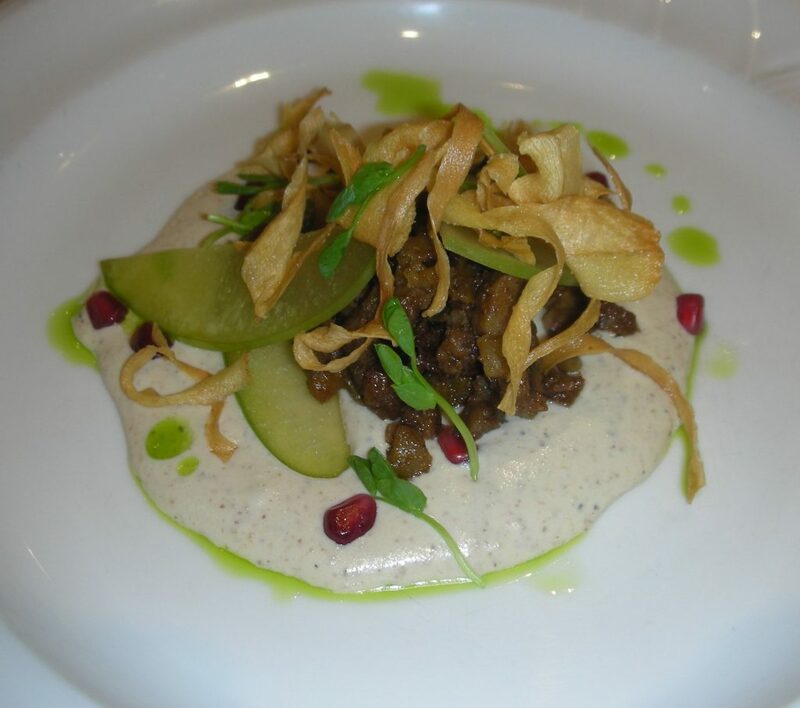 Our third dish turned out to be from Chef Davina Moraiko of RGE RD (Edmonton). She bought beef liver and bacon and turned them into smooth, silky paté, delicately enhanced with onion, garlic, brandy and butter. 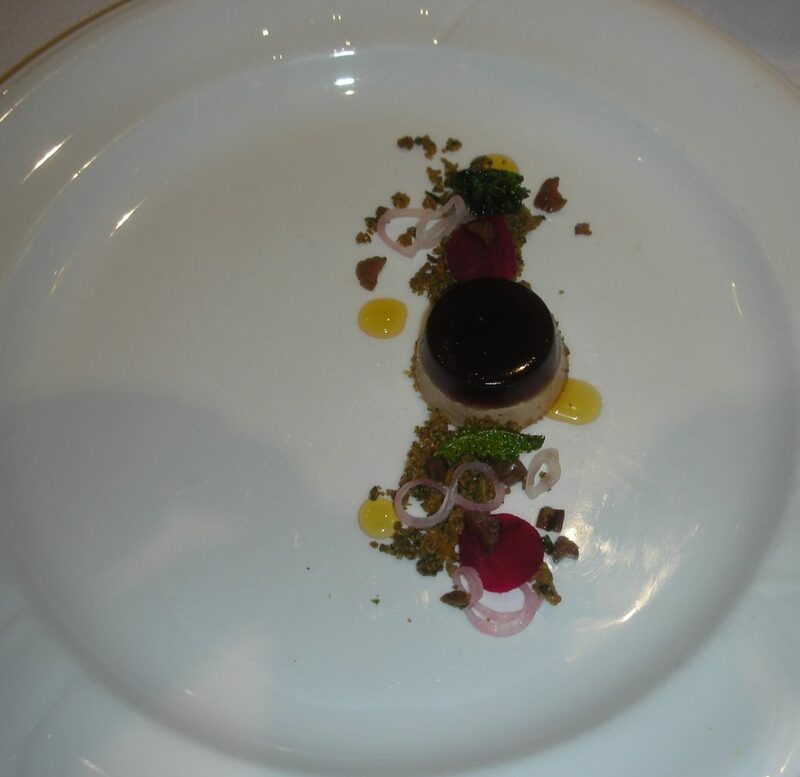 Shaped into a perfect disc, each portion was topped with a disc of aspic-like gelee made with the mystery wine itself and a touch of black currant. If the flavours so far were subtle, that was not the case with the accompanying streusel spooned daintily onto the plate, on either side of the paté. This was a moist crumble of reconstituted dried mushroom, onion and toasted rye flour with a powerful concentration of taste and umami. Garnishing the plate in a delightful way were dainty rings of pickled shallot, a brunoise of pickled beet, other savoury beets cut into dime-sized slices and beet greens fried to little crisps. Dots of a simple gastrique intensified the sweet-sour character of some of these elements even further. Interestingly, the bold acidity of the pickles did not battle the wine’s own acidity – they were finely balanced and when one built up a forkful of all the ingredients on the plate it matched the wine as well as any dish of the evening. 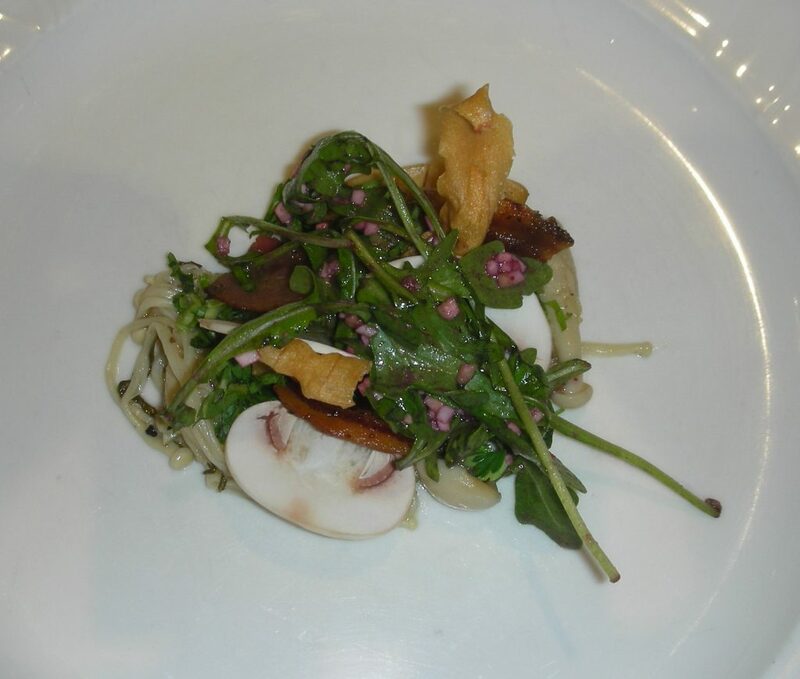 Dish number four was from Chef Jesse Friesen of The Merchant Tavern (Winnipeg). Chef made a delectable ragout using 80 percent lamb shoulder and 20 percent chuck flat to get exactly the desired ratio of lean to fat. The ragout began with onions, cumin, paprika, chili powder cooked in a pan that was then deglazed with the mystery wine before the meat was added. Several more components were folded into it just before service so that these extra ingredients could keep their textural and flavour integrity and make more precise contributions to the dish: chopped charred cabbage, grilled eggplant and a concassé of smoked tomato. Sharing the plate was a rich hollandaise made with bone marrow, bacon fat and egg yolk, and beside that a pool of green parsley oil. A dramatic pink dot of puréed pickled onion looked splendid and added useful sharpness to the dish. Three crisp potato chips finished things off. It was a consciously “comfort” creation and the pickled onion and smoked tomato flavours each did their best to flirt with the mystery wine. The fifth dish came from Chef Katie Hayes of Bonavista Social Club (Newfoundland). 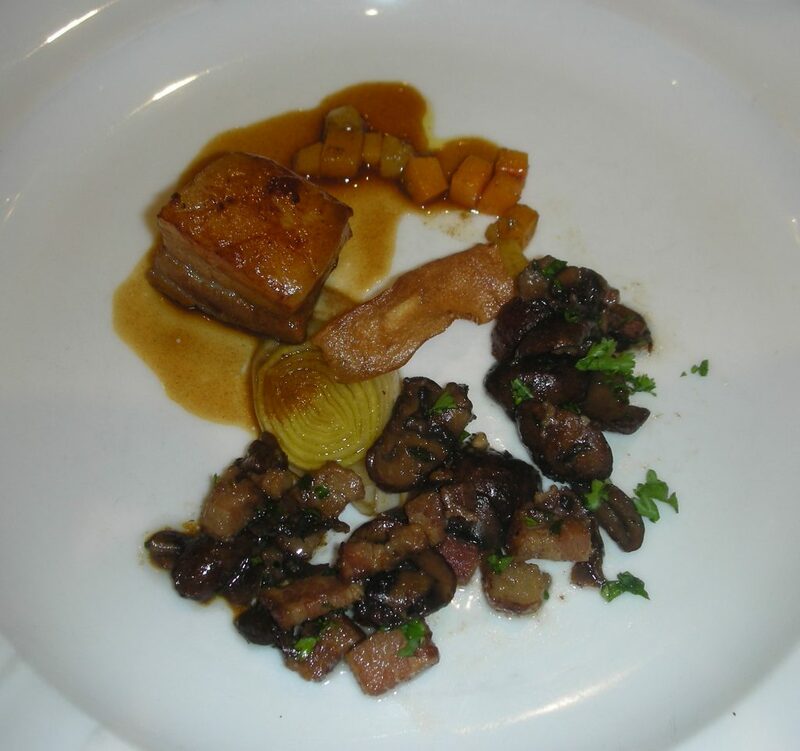 She braised pork belly in a stock enriched with vegetable mirepoix, garlic, dates and portobello mushroom, which she then reduced to a glaze to finish the belly and used as a sauce. Echoing these flavours, a jumble of diced portobello mushrom (lovely firm texture) and bacon brought extra umami to the proceedings. A brunoise of pan-roasted butternut squash offered a pleasing earthy sweetness, as did a single crisp parsnip chip as a garnish. In the centre of the presentation was a concentric slice of butter-poached leek (I wish I had been given 20 more). Mushroom dominated the flavours on the plate and it made some promising inroads into the wine without really embracing it. Sixth up was Chef Irwin MacKinnon from Papa Joe’s (New Brunswick/ P.E.I.). He roasted gorgeous beef striploins, finished them with a quick pan-sear in butter then set two tender slices onto each plate. They were propped up by a spoonful of toasted barley risotto, cooked with beef stock and enriched with butter, thyme and local Okanagan cheddar. Around that was set a snow-white purée of cauliflower and parsnip smoothed with butter and cream and subtly sharpened with a touch of horseradish – great with the beef, as you might imagine, but also unexpectedly wine-friendly. A few sweet green peas added colour and freshness while a wedge of soft golden beet brought another kind of rooty sweetness to bear and a crisp toast provided crunchy texturl interest. There were three sauces – a smooth veal jus, a spoonful of classic Argentine-style chimichurri for herbal tang, and a drizzle of concentrated black cherry balsamic that formed a very successful bridge into the wine. Our seventh competitor was Chef Yannick LaSalle from Les Fougères in Chelsea, Quebec (Ottawa-Gatineau). He decided to honour the B.C. landscape with a medley of local mushrooms, beginning by creating a creamy base for his dish using dried ceps, dried chanterelles, roasted garlic, onions and the mystery wine. He cooked king erengi mushrooms in brown butter, then he sautéed fresh enoki, shiminji and shiitaki mushrooms and lightly pickled them in wine, lemon and thyme, bringing out their various flavours nicely. To finish this mixture he sliced and scattered a few more raw mushrooms and added some finely chopped fried pancetta. A gremolata of parsley, lemon juice and garlic was spooned over the top while a little sweet-tart raisin and caper emulsion allowed to fine tune the acidity. Organized over the top was a salad of arugula and chopped celeriac dressed with a vinaigrette made of the reduced mystery wine, truffle oil and oil of roasted garlic. Salty, crispy parsnip chips finished the dish. Plated in a tightly sculpted arrangement, the flavours were forced together, with the mushrooms a mellow base and the garlic, lemon zest and thyme carrying the aromatic tune. I found it one of the three best wine matches of the evening, though other judges weren’t so cionvinced by the citrus-vino relationship. Number eight? Enter the dish from Chef Thomas Carey of Fresh Twenty One in Dartmouth, Nova Scotia. He gave pork shoulder the classic char siu treatment, marinating it in honey, hoisin sauce, five spice, ginger and garlic then slow-roasting it to perfection, constantly basting the surface with the glaze until it was sticky and black and slightly crusty, while the meat inside was rich and tender. He did not use the glaze s a sauce but created a different one, aimed squarely at the wine, using veal stock, dried and fresh cherries, slow-cooked onions and the mystery wine itself. On the plate we also found lovely snow pea leaves, softened in warm butter and garlic, and a spoonful of charred eggplant ziped with lemon zest. A nest of fresh pear and mint brought freshness. 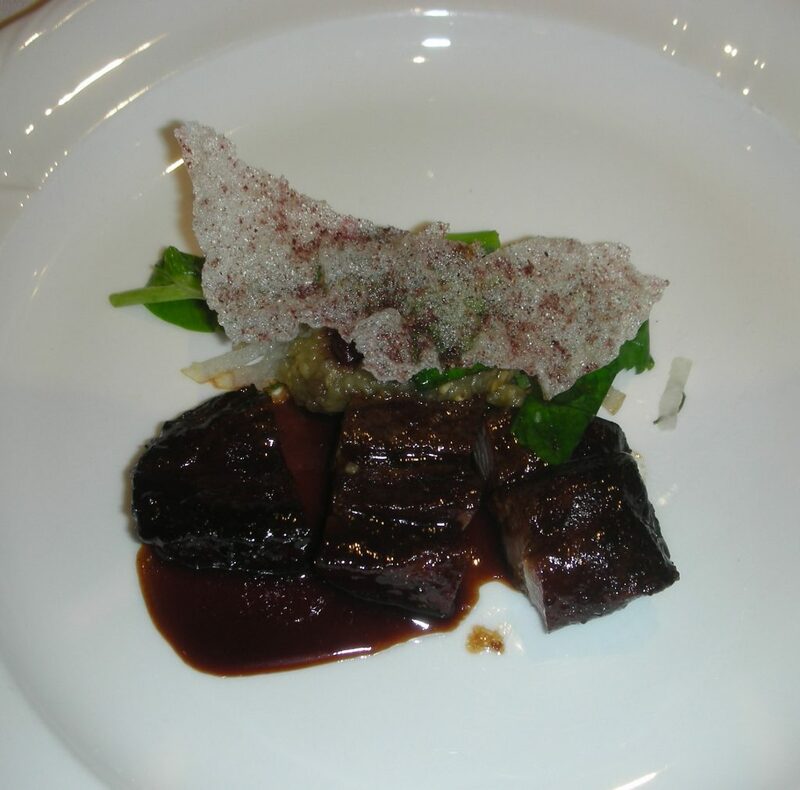 Dramatically white against the black char siu, a cracker of deep-fried rice paper was dusted with powdered rosehip and hibiscus. Again a chef had tried to sweet-talk the Cabernet; again the dish was given the cold shoulder. 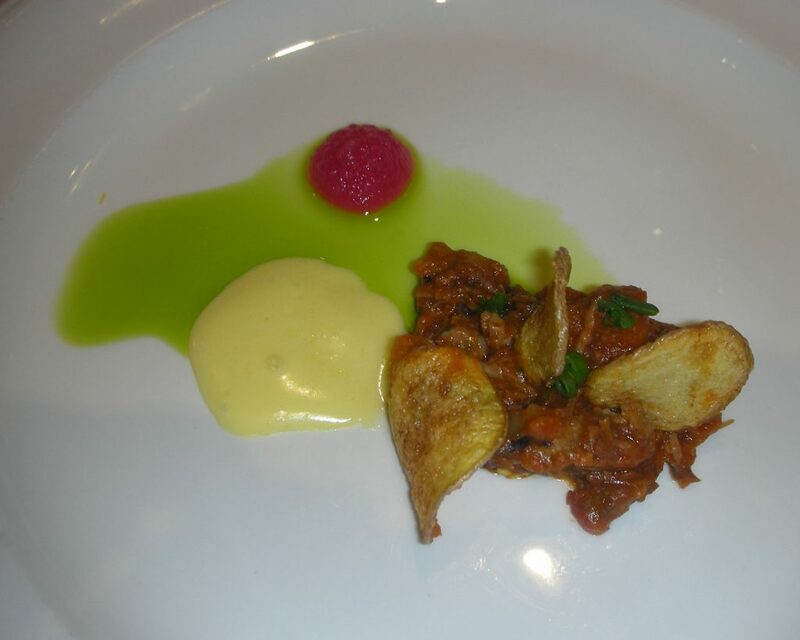 The ninth dish we tasted came from Chef Takashi Ito of AURA in Victoria, B.C. He started with pork belly, braised with a vegetable mirepoix and togarashi, then pressed, then pan-seared to crispness at his station. Beside it were potato gnocchi finished with truffle oil, olive oil and salt, while the plate was decorated with a swoop of banana squash purée sharpened with lemon and smoothed with butter and cream. The final touch was a scattering of tenkasu, the little batter pearls hiding flecks of green onion and black sesame seeds. It was a yummy dish but the consensus among the judges was that it made no headway with the elusive wine. 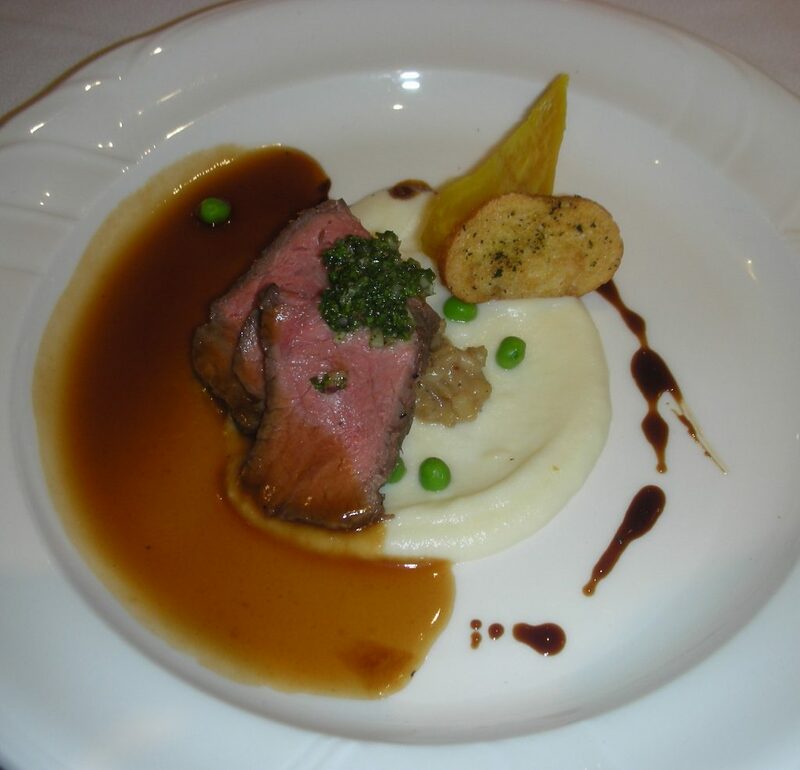 The tenth and penultimate entry came in from Chef Dave Bohati of Murrieta’s (Calgary). Alone among our competitors he turned to the sea for his principal protein – a juicy slice of Nova Scotian monkfish tail cooked sous vide then pan-seared. Sharing the limelight across the plate was a piping hot, crusty arancini fiulled with mushroom duxelles and ham hock (so delicious). More ham hock was pulled and scattered on the late while the arancini was posed on a pool of pungent smoked mussel aïoli. Carrot and brown butter purée scented with cardamom added another dimension, as did a profound lobster jus reduced almost to a demi-glace. Here we discovered compressed fennel, and there rice chips, pickled carrot and earthy red sunchoke. A mound of crumbled peanuts, spiced and roasted in pork fat was the envoi. There was a lot going on and the scatter-gun approach to the match scored one bullseye with the mussel aïoli – again, smoke seemed to please the wine. Our last dish came from Chef Jason Morris of Pastel (Montreal). 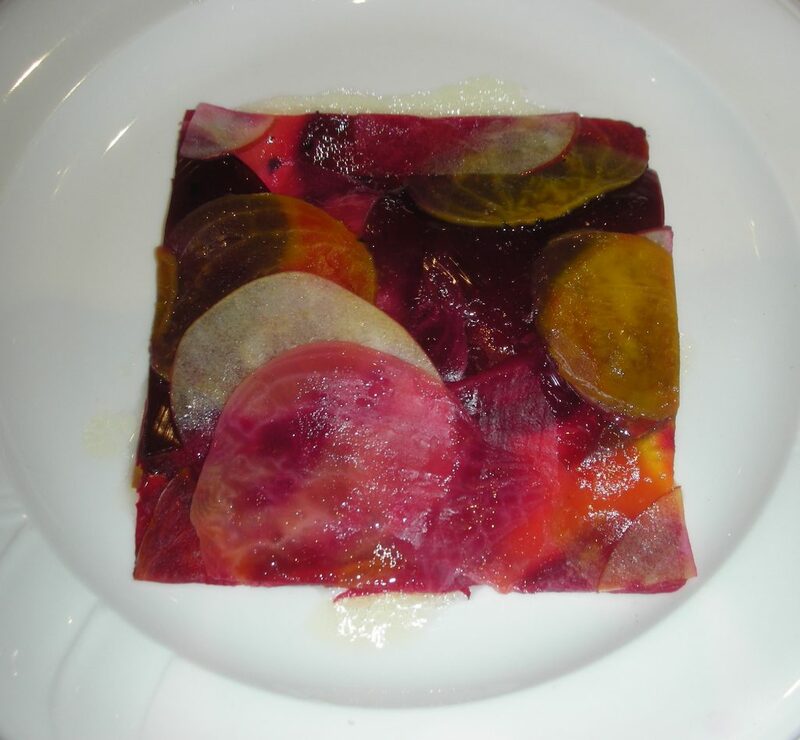 Visually stunning, it was “a stained glass window” of various purple, pink and golden beets and pink lady apples. The beets were lightly smoked over vine wood that Chef bought at dawn from a local winery, then macerated in red wine vinegar and olive oil, sliced so thinly they really were almost translucent and arranged so that th slices overlapped. Holding them in place was a skin of transparent jelly made from the mystery wine. Other treats lay hidden beneath this beautiful veil – dried cranberries rehydrated in apple cider; candied walnuts and a creamy dressing of soft goat cheese loosened with goat’s milk yogurt. A last dressing of olive oil, walnut oil and cider, was purposely split, not emulsified and drizzled o’er. It was a dish of subtle, earthy and nutty flavours, with smoke very much a presence and one of the better wine matches of the night. If this was a blind date on a reality show, I don’t think the wine would be going home with any of these dishes. It proved remarkably difficult to woo. Perhaps all that alcohol left it deaf to all the whispered culinary endearments. When all the marks were in we could see that every one of our competitors was part of a single group, like runners in the early stages of a long, long race, shoulder to shoulder – Chef Hill half a step in front of Chef LaSalle, chefs Hayes and Herrera tied for third. It was still, very much, anyone’s game.